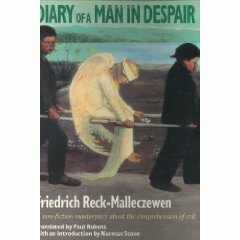 I recently read ‘Diary of a Man in Despair’ by Friedrich Reck-Malleczewen. It was a bit of a wild-card choice, but turned out to be an extraordinary book. Reck-Malleczewen was an aristocratic German living in Bavaria, and the book is his account of how Germany descended into Nazism. His hatred of Hitler shines through on every page as he documents how German society became ‘infected’ with the mass-hysteria and corrupted moral frameworks of Hitlerism. This is not a book about WWII; it contains only fleeting references to the battles, occupations and holocaust which are the mainstay of most histories. Rather it is a collection of essays, written as events unfolded, reflecting on the willingness of an entire people to ally themselves with tyranny and corruption. The writing is powerful and evocative, and whilst some of Reck-Malleczewen’s viewpoints and values may be somewhat archaic to modern sensibilities, the portrait that emerges is of a man who refuses to compromise his beliefs and morals, whilst around him society disintegrates. One of the most extraordinary things about the book, though, is just how contemporary it sounds. There are passages which resonate profoundly with our own society, offering disturbing insights into just how easily such a madness could overtake us again. Or perhaps is already overtaking us. The book ends abruptly just weeks before the end of the war. Reck-Malleczewen was arrested and murdered in Dachau in February 1945.